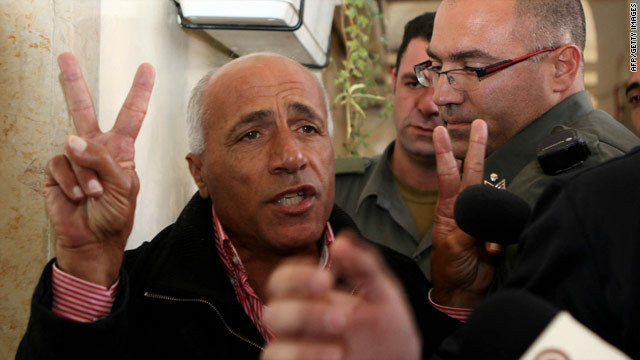 Mordechai Vanunu flashes the "V" sign before a court appearance in Jerusalem late last year. Jerusalem (CNN) -- Israeli nuclear whistle-blower Mordechai Vanunu was sent back to prison Sunday for violating terms of his parole, prison authorities said. Vanunu will serve a three-month sentence in Eshel prison, for refusing to do community service in a Jewish neighborhood, prison authority spokesman Yaron Zamir said. He was arrested in December for an unauthorized meeting with foreigners, police said at the time. His lawyer Avigdor Feldman claimed the arrest had to do with his client's relationship with a Norwegian girlfriend and nothing to do with revealing state secrets. Vanunu was convicted by an Israeli court in 1986 after being snatched from Italy by Israeli intelligence agents. He was sentenced to 18 years for passing on information about Israel's clandestine nuclear program. Vanunu, who worked as a technician at Israel's nuclear research facility, passed information along to a British newspaper and led nuclear arms analysts to conclude that Israel possessed a stockpile of nuclear weapons. Israel has neither confirmed nor denied that it has a nuclear weapons program. Speaking to reporters at a Jerusalem court after his arrest in December, Vanunu said Israel and its leaders were "impotent" because they have nuclear weapons which they are not able to admit they have. "This Jewish state has 200 atomic ... hydrogen bombs, atomic weapons, neutron bomb," he said. "They are not able to say they have the bomb, they are not able to destroy anyone. ... Instead they arrest Vanunu, Mordechai." At the time of his release in 2004, the Israeli Justice Ministry said in a statement that it believed there was a "high degree of probability that Vanunu wishes to divulge state secrets, secrets that have yet to be divulged." According to the terms of Vanunu's release, he is prohibited from leaving the country or making contact with foreign residents without advance permission. Since then, Vanunu has been arrested on a number of occasions for violations of his release agreement, and in 2007 he was sentenced to six months for not fulfilling his parole requirements. In his remarks to reporters in December, Vanunu said that since his 2004 release he has met with foreigners "all the time" and that he had been living among foreigners.